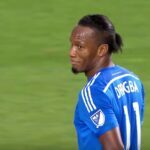 In the second minute of Montreal’s match against Orland, Didier Drogba took a free kick and added a bit of wizard magic to it. The ball moved in slow motion and right at the goalkeeper, hypnotizing him into pushing the ball into his own net. Orlando went on to win 4–1 after Montreal’s goalkeeper was sent off early in the second half, but only because Drogba didn’t feel like stopping time all together and scoring five more times while everyone else was frozen in place.